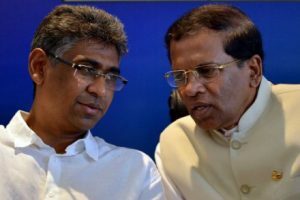 The Government which tried all kinds of ruses to get out of holding the local government elections is adopting a similar strategy with respect to Provincial Councils, Colombo Telegraph learns. Faizer Mustapha, Minister of Provincial Council and Local Government, is sitting on important legislature which could expedite the holding of provincial council elections. Earlier, Mustapha embarrassed himself by using proxies to move court to postpone local government elections, but was stumped when the Elections Commissions pointed out that elections to 93 councils could be held. Mustapha had to then use others to challenge his own petition and have it thrown out of court. After the two major parties in the ruling coalition, the UNP and SLFP, would roundly defeated at the February 10 local government elections, both parties are reluctant to face the voter any time soon for fear of further decline, party sources told Colombo Telegraph. The Sri Lanka Podujana Peramuna (SLPP), which emerged as the clear winner on February 10 itself is not enthusiastic about provincial council elections because it is lobbying for a major election, either Parliamentary or Presidential, SLPP sources said. Although the Prime Minister and leaders of all parties represented in Parliament have been briefed by the Elections Commission about various possible courses of action regarding provincial council elections, there is complete silence on the subject. Political analysts however argue that the Elections Commission will have to petition court or make its position clear on the matter of holding provincial council elections. it is wise for SLPP to insist on Provincoal election and then Presidential election and last Parlimentary election. Then Basil will have a chance to would be MPs to support for his Presidential bid. This is a golden oppertunity for BAsil. He should not forego . Why his assets in His family’s naturalized county has gone down in value and are almost useless ? SO, he wants some new money to buy lands in Bengal ? Any election promise to have a good clean war against Muslims or recreated imagined LTTE? Basil has had long experience in making money out of each contract. He was the understudy to Dutta Gamani with whom he did his articleship and later hands on experience. The real question is how would you and your family personally benefit from his success? Provincial Councils were bandaids to the festering language/religion-divide wound. They do not serve the purpose but have become happy-hunting grounds for the “New-Terrorism” networks. (New-Terrorism is a realm in which corruption/nepotism/impunity are legitimate.) Now they are albatrosses round our neck and they have come home to roost. Let us ponder a bit. Had the minority grievances been addressed early, would this PCs have eventuated? A misogynist like the Uva CM? Governors – what use are they? No use if caste is a criterion in appointments? Do we need 9 high Caste Misogynists , who are into Corruption,Nepotism and legitimate Impunity?. Our Dalits certainly wouldn’t want them. Most worrying is these Misogynists with all those you beaut characteristics getting the power to run their own Police and the right to own the public Land. through Dr Ranil’s Partition Constitution. Treasure hunting UNP Deputy has already bull dozed Dutu Gamunu’s base camp to build houses for UNP supporters. This UNP Deputy is a big shot. Just imaging those Misogynist small shots also getting into action with all those powers to Police the Land. Loca councils 8500. Now Provincial councils, they want, how many of them employed.. that is before the PREsidential elelction and general elections. What we have achieved with this crack heads See how families and relatives are in the PArliament. Father and son, Brother and Brother, Wife and husband, Father inlaws and son inlaws, brother and sisiter. what a way for news media to ruin the country..
We held local elections. Why do we need provincial councils too ? Judging from the local government elections, I may not like the outcome of the elections but I must uphold the sovereign right of the people to vote for office to all elected bodies well on time. The moment you delay elections or tinker the rules the rumor that the fellows are prolonging their ability to rule simply because to make hay while the sun shines is made true. Then the idea set in that if those who took office through an election now dis-respect that then others too can disrespect the tenets of democracy. That is dangerous. This is a democratic country and let every person in this country respect the principles of democracy. enough elections for this year.Let next year be the election year for all provincial councils. The problem with elections is that they never seem to deliver the result that we all want. For various reasons, we select the wrong party, and within it, the wrong people. We all KNOW that, and each of us is sure that s/he is right – but each of us also has a very different notion of which party and which individuals are best. This is the problem with democracy, and there’s only one solution. Elections must be held on the due date, whether it suits our individual preferences or not. Deviate from that, and all possibility of fair-play, justice and decency, are gone for the time being. Allow it to become accepted practice, and we entrench cynicism to be the social philosophy of the world, and we ensure that the mind of every individual is permanently warped. In “successful countries” elections are held, and results accepted even if well nigh all “discerning people” know that the result is terrible. So Trump is the American President. Nobody can manipulate the dates on which elections are held in the USA, or France. It’s become that even in the U.K. I see only two comments above. “Uneducated” Bandara wants elections to be held to suit Basil. K. Pillai has not questioned that elections must be held, but seems to be saying that at some point our entire society must decide what is best for all. For that the Constitution will obviously have to be changed. Both seem to advocate sticking to the legitimate order, but for different reasons. Thanks to both Bandara and Pillai for presenting views which starkly sum the position up for us. I have referred to Bandara as “uneducated”. That is because his English is poor. As yet there have been no protests. Eight comments so far, mine is the last. Protests must come, but please note the quotation marks. All citizens have an equal say in our form of democracy. In some ways good, in other ways bad. English is somebody else’s language. Mine is Sinhala. I accord equal status to Tamil, but I have not learnt it, and will not learn it. For me it will be a lot of time wasted. I hope that younger Sri Lankans will learn both National Languages. Mr Bandara, and others who support his hero, must be treated with all the respect due to them. My personal view is that any Rajapaksa again will be a disaster; right now Gota seems to be the favourite of some. Why is Basil referred to as Mr 10%? I’d like you to tell me, Mr Bandara. Mr Sinhala man your English may be better than mine. The purpose of language is communication, if you are not cognizant of that I cannot help you, please grow up, donot worry it wont be a waste of time trying to grow up. This country benefited from the agricultural policies of DS, JR’s open economy, Premadasa’s development program and next was Basil’s development activities. All what Gota did was a waste, unrealistic and short term programs and limited to Colombo. We will be in the worst predicament at the next Presidential election, we will be left to choose best of the worst candidates ever in Sri Lankan history. After making my initial comment, I submitted another explaining that I don’t REALLY consider you “uneducated”. When one puts a word within quotes one is saying that one doesn’t really mean what the the unthinking many understand by it. There are lots of other helpful sites; I do sometimes check my own English usage sometimes. In terms of party politics it looks as though you’re now saying something quite different from what you did in the first comment. I tend to lump all the Rajapaksas together; one is not better than the other. Please look again at what I have written. I have said that English, per se, is NOT important. And that first comment may have been written in a hurry, or when tired. This next comment of yours displays quite acceptable English. Defeated PM of Malaysia had about Rs 3000 million of Sri lankan money.IT is said, that Maithripala Sirisen hid it to take when the WARAKAN times comes. Now he is planning to bring it to Thailand for sake keeping. IF asked he would say Ranil did it to ruin him. It is not just the government that is involved. Various other interested parties do not want the new election method, as they lost out on the local elections. The G.G. regime misjudged the electorate all along, despite the two elections of 2015 giving a clear picture of where it stood with the voters. The more they delayed the local elections, the worse it got for them. There are other increasingly powerful and dangerous players besides the electorate and the elected that will decide affairs of the state. The risk that the country could sleep walk into a fascist dictatorship is more real now than a few years ago. The comments we read have become boring as same names appear always and the comments show their political allegiances and not rational factual and constructive. They are like the utter lies said at press conferences held almost daily.